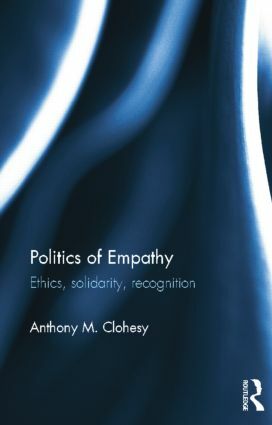 The Politics of Empathy argues that empathy is a necessary condition for ethical subjectivity and the emergence of a more compassionate world. One of the reasons empathy is important is because it gives us a sense of what it is like to be someone else. However, to understand its ethical significance we need to look elsewhere. This book claims that empathy is ethically significant because, uniquely, it allows us to reflect critically on the nature of our own lives and sense of identity. More specifically, it allows us to reflect critically on the contingency, finitude and violence that define existence. It is argued that, without this critical reflection, a more ethical and democratic world cannot come into being. Our challenge today therefore is to establish the social and political conditions in which empathy can flourish. This will be a difficult task because powerful political and cultural forces are reinforcing the divisions between us rather than encouraging us to come together in a cosmopolitan community of mutual recognition and solidarity. However, despite these limits, there is hope for a brighter future. The book argues that this can only come about if the Left accepts its responsibility to articulate the contours of a new politics of internationalism and establish the foundations of a sustainable ethical community in which strangers will be accepted unconditionally. This work will be of interest to students and scholars of political theory, multiculturalism and international relations. Anthony M Clohesy teaches at the University of Essex, UK.